As I wrote in the prior entry, I am still trying to catch up with my trading activity from last week. This entry should bring the blog up to date with all of my recent trades accounted for. I apologize once again for letting my blogging lag behind my trading. It is all a part of being an amateur I guess :). As I reported previously, I sold my 161 shares of Genoptix (GXDX) on the same day I purchased them--August 14, 2008. On that same day as well, I checked the list of top % gainers on the NYSE and noted that Estee Lauder (EL) had made the list. After a quick review of some of the data I use to screen stocks, I felt that Estee Lauder was an appropriate, and probably a less volatile, investment for me. First of all, what does this company actually do? "...engages in the manufacture, marketing, and sale of skin care, makeup, fragrance, and hair care products. Its products include moisturizers, creams, lotions, cleansers, sun screens, and self-tanning products; lipsticks, lip glosses, mascaras, foundations, eyeshadows, nail polishes, and powders; fragrance products for women and men; and hair color and styling products, shampoos, conditioners, and finishing sprays. 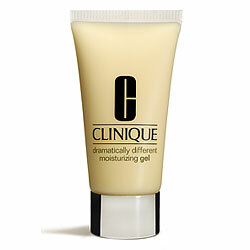 The company offers its products under the Estee Lauder, Aramis, Clinique, Prescriptives, Lab Series, Origins, MzAzC, Bobbi Brown, La Mer, Aveda, Jo Malone, Bumble and bumble, Darphin, American Beauty, Flirt!, Good Skin, and Grassroots brand names. It also manufactures and sells Kiton and Toni Gard products as a licensee." In my family, I can tell you that it is Clinique that is the most popular of the Estee Lauder brands. It was actually, as is often the case, the announcement of fourth quarter earnings on Thursday, August 14, 2008, prior to the opening of trading, that drove the stock higher in trading and led to it being on the 'top % gainers list' where it caught my own attention and landed it in my portfolio. For the quarter ended June 30, 2008, the company reported net sales of $2.01 billion, up 14% from $1.76 billion the prior year. Even without the effect of currency exchange rates, the company reported an adjusted sales increase of 9% year-over-year. Net earnings for the quarter climbed 36% to $120.2 million, up from $88.6 million the prior year. On a diluted earnings per share basis, this worked out to $.61/share this year, a 38% increase over the $.45/share reported last year. These results were strong even more than just because they were solid results; that is, they also beat expectations. Analysts polled by Thomson Reuters had expected a profit of $.56/share (the company came in at $.61) on revenue of $1.93 billion (they came in at $2.01 billion). The company appeared to have reassured skittish investors regarding 2009 results guiding to a sales growth of 6 to 8% (adjusted for exchange rates) to $8.39 to $8.54 billion in 2009. They expect profits between $2.57 and $2.72/share. Earnings guidance was within expectations but revenue guidance was above expectations according to analysts polled by Thomson Reuters. With these strong results exceeding expectations and guidance for 2009 with earnings at expectations and revenue above expectations, the stock moved ahead in price enough to make the top % gainers list where it caught my own attention and interest. What caught my attention with this stock was the strong earnings report. What 'clinched the deal' was the superb longer-term record as reported on the Morningstar.com '5-Yr Restated' financials page for Estee Lauder (EL). Revenue growth has been steady since at least 2003 when the company reported $5.05 billion in revenue, increasing each year to $7.04 billion in 2007 and $7.66 billion in the trailing twelve months (TTM). Earnings, except for a dip between 205 and 2006, have also shown steady growth with $1.26/share reported in 2003, increasing to $1.78 in 2005, dipping to $1.12/share in 2006, only to rebound to $2.16/share in 2007 and $2.25/share in the TTM. The company does pay a dividend and has been increasing it almost yearly from $.20/share in 2003 to $.50/share in 2007 and $.55/share in the TTM. Outstanding shares were 235 million in 2003 and the company has been retiring shares to 208 million in 2007 and 205 million in the TTM. Free cash flow has been positive if a bit erratic with $249 million in 2005, $449 million in 2006, $350 million in 2007 and $379 million in the TTM. The balance sheet appears solid with $410 million in cash and $2.4 billion in other current assets. This total of $2.81 billion, when compared to the $1.77 billion in current liabilities yields a current ratio of 1.59. The company has an additional $1.729 billion in long-term liabilities. Reviewing the Yahoo "Key Statistics" on Estee Lauder (EL), we can see that this is a large cap stock with a market capitalization of $9.81 billion. The trailing p/e is a very reasonable 20.98 with a forward p/e even nicer at 16.81 (fye 30-Jun-2010). However, the PEG ratio is a bit rich (I like to see ratios of 1.0 to 1.5 or less) with a result of 1.70. As reported by the Fidelity.com eresearch website, EL is a good value as measured by the Price/Sales (TTM) ratio with Estee Lauder coming in at 1.23 with an industry average of 1.58. In terms of profitability, as measured by the Return on Equity (TTM), EL doesn't do quite as well with a figure of 32.63% compared to the industry average of 50.12%. Returning to Yahoo, we find that there are 194.4 million shares outstanding. As of 7/28/08, there were 10.14 million shares out short representing a 5 day short interest ratio. With the outstanding earnings report, we may have been witnessing a bit of a 'squeeze' as short-sellers scrambled to cover their 'pessimistic'wagers and instead rushed to cover their short sales by purchasing stock. As noted above, the company pays a forward dividend of $.55/share, yielding 1.10%. The last stock split was a 2:1 split back on June 3, 1999. 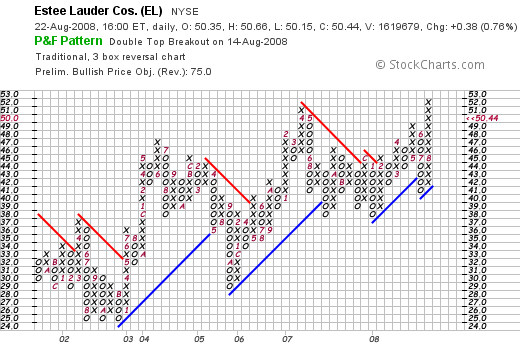 Examining the 'point & figure' chart on Estee Lauder (EL) from StockCharts.com, we can see the dip in price in 2005/2006 coinciding with the dip in earnings per share. Otherwise the chart appears quite strong with the price staying above the support lines and breaking through resistance earlier this year when it passed through $45/share. This chart looks nice to me! I really like this stock pick a lot. In fact, I liked it enough that I bought shares :). This isn't about the Peter Lynch aspect of this investment---you know with my wife and daughters supporting the Clinique brand of EL--but more about all of the usual factors I use to 'pick' a stock. The company moved strongly higher on the 14th of August after announcing a strong earnings report that beat expectations. Longer-term, this company has been reporting steady revenue and earnings growth (even after adjusted for currency effects). They pay a dividend and they are increasing it. They have a decreasing number of outstanding shares, the free cash flow is strongly positive and the balance sheet looks solid. What is there not to like about this stock? Valuation-wise, the P/E is just over 20, the PEG is a bit rich, the Price/Sales ratio compares favorably with its peers, and the Return on Equity is solidly positive if a bit under where its peers are trading. Thanks again for stopping by and visiting! If you have any comments or questions, please feel free to leave them on the blog or email me at bobsadviceforstocks@lycos.com. If you can, be sure and visit my Covestor Page where my actual trading portfoli is monitored and evaluated, my SocialPicks page where my stock picks from early 2007 on are monitored, and my Podcast Page where you can download an mp3 or two of me discussing some of my favorite investments from the blog. First of all I would like to apologize for the paucity of posts on the blog the last week or two. I would encourage you all to utilize my Covestor Page to find out how my actual holdings are doing when I am not blogging. And I shall try to get back 'in the saddle' once again, and catch all of you up on my latest thoughts and observations. I have been making some adjustments to my trading strategy without really changing the mechanics underlying my approach. What I am trying to say is that I have chosen to sell some positions that appear to be in the wrong 'groups' or 'industries' and switch to other companies that appear to be acting 'healthier'. Concerned that my Morningstar (MORN) stock was acting 'sickly', I chose to switch out of this pseudo-financial stock and try something else for my holding. Looking through the list of top percentage gainers on the NASDAQ, I came across Genoptix (GXDX) that appeared to fit the bill. I went ahead and purchased 161 shares of GXDX on August 14, 2008, (a peculiar number but divisible by 7--my first partial sale amount) at $38.328/share. However, GXDX immediately started to trade weakly, and not wanting to move from one weak stock to another, I went ahead and sold my 161 shares the same day (!) at $37.028. Looking at the list of top % gainers on the NYSE that afternoon, I found Estee Lauder (EL) and purchased 140 shares at $49.87---but that is the subject of another blog entry. "...provides specialized laboratory service that focus on delivering customized and collaborative diagnostic services. Its services include COMPASS service offering, in which the company's hematopathologists determine the appropriate diagnostic tests to be performed, and then integrates patient history and all previous and current test results into a comprehensive diagnostic report; and CHART service offering, in which the hematologists and oncologists receives a detailed assessment of a patient's disease progression over time. The company also offers multiple diagnostic services, such as professional interpretation by its hematopathologists." On July 31, 2008, Genoptix (GXDX) reported 2nd quarter 2008 results. Revenues for the quarter came in at $27.8 million, up from $13.9 million the prior year. GAAP net income for the quarter was $5.6 million, compared to $3.8 million the prior year. This worked out to $.32/share vs. the $.03/share reported the prior year. The company also raised guidance with Medicare reimbursement rates confirmed, to $105 to $108 million in revenue for the year, up from prior guidance of $90 to $95 million in revenue. Net income figures were also raised from $15 to $17 million to approximately $20 million for the year. Seeking Alpha has the Conference Call Transcript on this quarterly result for your further review. Reviewing the Morningstar.com "5-Yr Restated" financials, we can see that this company has grown rapidly from its $200,000 in revenue in 2003 to $59.3 million in 2007 and $84.9 million in the trailing twelve months (TTM). Earnings have improved from a $(184.35)/share loss (!) in 2003 to a loss of $(33.74)/share in 2006, turning to a profit of $.78/share in 2007 and $1.35/share in the TTM. Morningstar shows 4 million shares in 2007. According to Yahoo, there are currently 16.5 million shares outstanding--and also according to the latest quarterly report, there are 17.5 million shares when the full "dilution" is considered. Free cash flow has improved recently from $(10) million in 2005, to $(4) million in 2006, $12 million in 2007 and $18 million in the TTM. The Balance Sheet on Morningstar.com appears solid with $51.0 million in cash and $60 million in other current assets. Compared to the $10.9 million in current liabilities, this yields a current ratio of 10.2. The company has virtually no long-term debt with $300,000 in long-term liabilities reported. Reviewing the numbers from Yahoo "Key Statistics" on Genoptix (GXDX), we can see that this is a small cap stock with a market capitalization of only $554.28 million. The trailing p/e is a moderately rich 30.18, with a forward p/e (fye 31-Dec-09) of 30.21. However, the '5 yr expected' growth is substantial enough that the PEG is estimated at 0.64. Reviewing the Fidelity.com eresearch website, we can see that the stock is still rather richly valued with a Price/Sales (TTM) of 6.38, compared to the industry average of 0.89. Fidelity does suggest that the company is quite profitable, however, with a Return on Equity (TTM) of 24.76% compared to the industry average of 18.77%. Returning to Yahoo, we can see that there are 16.53 million shares outstanding and currently there are 994,320 shares out short (as of July 28, 2008), representing 7.2 days of average volume (the short ratio). This exceeds my own '3 day rule' making the short interest significant from my perspective. No dividends are paid, and no stock splits are reported on Yahoo. 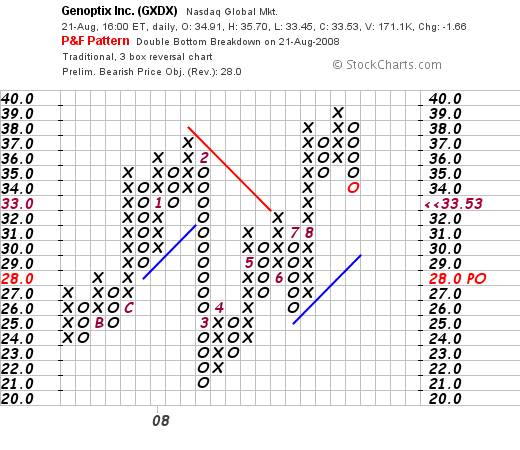 When we examine the 'point & figure' chart on Genoptix (GXDX) from StockCharts.com, we see that the chart is relatively optimistic yet showing some signs of fairly significant volatility. Since coming public in October 2007, the stock has traded from $24 to $37 in January, 2008, only to dip to $21 and start its move higher once again. The stock recently peaked at $39 in August, 2008, but has now dipped back to $33. Overall, the chart appears to be intact with the stock trading through resistance and above support levels. Overall, I still like this stock. It is a bit small and very volatile trader, but the prospects appear to be good with the company reporting solid earnings and revenue results and raising guidance on both. My own short-term ownership of this stock was limited likely to my own poor timing of my purchase in a stock that was a bit 'over-extended' technically. Valuation is a bit rich but the stock is just currently turning profitable and this is to be expected. Thanks so much for stopping by and visiting my blog. If you have any comments or questions, please feel to leave them on the blog or email me at bobsadviceforstocks@lycos.com. If you get a chance, be sure and visit my Covestor Page, where you can review my continuously updated trading portfolio results and performance, my SocialPicks page which monitors my stock picks from early 2007 through current posts, and my Podcast Page where you can listen to me discuss some of my picks from this blog. Wishing you all a wonderful Friday and weekend! Morningstar (MORN), Genoptix (GXDX), and Estee Lauder (EL) "Trading Transparency"
Last week, on August 14, 2008, I chose to replace what I felt was a relatively weakly performing stock with something acting healthier. This is certainly outside of my "rules" for trading, but I am trying to enhance the performance of my portfolio by trying to identify similar stocks that do meet my criteria as well but are technically, from my perspective, appear to be trading better in the market. I am not sure if this will be a successful intervention but as I have always done on this blog, I wanted to share with you my thoughts and observations. It is possible that I acted merely by 'chasing performance' and shall actually underperform the market in the days ahead instead of accomplishing my own goal of outperformance. In so many ways, after these many years of trading, I remain an amateur. So bear with me and I shall explain the 'lateral' move I made. First of all, I sold my 103 shares of Morningstar (MORN) from my trading account at a price of $64.794. These shares were initially purchased 11/22/05 at a cost basis of $32.57, so I had a realized gain of $32.22 or 98.9% since purchase--so it isn't like I had a loss on this stock or anything! But if we take a look at the Morningstar "point & figure" chart from StockCharts.com, we can see the relatively anemic performance of this stock after hitting $86 in December, 2007. Initially, I purchased shares of Genoptix (GXDX), but with the same-day weakness in THAT stock, I sold shares and settled on Estee Lauder (EL). More details to follow. I have been doing a little bit of "micro-managing" of my portfolio. I swapped out my VIVO for RMD hoping to catch a bit more momentum, and now, noting that my Lufkin (LUFK) stock, which I just recently purchased 7/16/08 at a cost basis of $91.10 has been struggling while the rest of the market has been rallying, I chose to sell my shares. They really hadn't hit a sale point, and we shall need to see if this is a reasonable decision or whether by ignoring my own 'trading rules' I was a bit hasty, lost patience with a great company, and instead jumped on a stock that was heading towards a correction. However, in light of my own sale of Lufkin (LUFK), I am reducing my rating. What has been driving this market higher recently has been the relative collapse in the price of oil. However, what is good for the market, may not be good for Lufkin (LUFK), which otherwise has superb fundamentals. The market paints stocks with a very broad stroke, so that the "baby is frequently thrown out with the bathwater". My approach to investing is strongly related to earnings growth and fundamental performance reflected in a higher stock price. When a stock starts trading in a fashion tied to a commodity, whether that commodity be oil, gold, or pork bellies, then all bets are off. "A strengthening dollar helped lower the price of a barrel of oil. Light, sweet crude fell $4.91 a barrel to $115.11 on the New York Mercantile Exchange, bringing its decline over the past four weeks to more than $30." That's right. $30 drop in four weeks. Virtually a collapse. Will oil move higher next week or next month? Will it trade instead closer to $80/barrel than $140 or is it going to trade at the same price? Frankly, I don't know. And I am not sure anyone knows for sure anyhow. But I want to be investing in some sort of rational fashion. I am not interested in speculating on stocks based on the movement of commodities. I suppose it is also just sour grapes. After all, I wouldn't be complaining if Lufkin was moving higher today instead of being slightly lower while most of the rest of the market powered ahead. So earlier today, I sold my 70 shares of Lufkin (LUFK) at $89.76. These shares, as I have noted, were purchased 7/16/08 at a cost basis of $91.10/share. Thus I had a loss of $(1.34) or (1.5)% on this purchase. Generally I wait for a loss to build to (8)% before initiating a sale after a purchase of a new position. However, as I have said many times, I reserve the right to sell a stock based on any 'fundamental' issues. With the oil market correcting, I wanted to step aside. To make sure that my own holdings would not be overly impacted by a correction in a commodity as significant as oil. With the sale completed, I turned to the list of top % gainers on the NASDAQ where I found an 'old favorite' of mine, Quality Systems (QSII) on the list. After purchasing shares at $38.13, the stock did decline slightly and closed at $37.80, up $4.51 or 13.55% on the day. "...engages in the development and marketing of healthcare information systems in the United States. Its system automates various aspects of medical and dental practices, and networks of practices, such as physician hospital organizations and management service organizations, ambulatory care centers, community health centers, and medical and dental schools. The company offers proprietary electronic medical records software and practice management systems under the NextGen3 product name." "The cost for the packaged electronic medical record (EMR) systems for a large teaching hospital is $1.95 million. The number sold at 126 in 2006 is anticipated to grow to 177 in 2013. The replacement cycle is generally six years for these electronic medical record (EMR) systems packages. Rather than rip and replace, systems tend to be upgraded to new versions. Electronic medical record markets are very significant. All facilities and all medical practices need to move to automated process that replaces manual handling of written patient records. The top 800 facilities worldwide are anticipated to spend hundreds of millions of dollars each to implement electronic patient records. While a lot of that spending will be on proprietary software, a lot of it will be for packaged software solutions." "Enterprise electronic medical record (EMR) market forecast analysis indicates that the future of care delivery depends on automation of process. The ability to quickly get a picture of patient condition depends on dashboards prepared by the primary care physician that quickly illustrate any noteworthy conditions that a patient may present. Markets at $1.8 billion in 2006 are anticipated to reach $3.2 billion by 2013. Worldwide enterprise electronic medical record (EMR) software markets will grow substantially as vendors are able to leverage the EMR expertise to provide competitive advantage from automation of process using IT infrastructure." But back to Quality Systems (QSII). It was the announcement of 1st Quarter 2009 earnings after the close of trading yesterday that drove the stock higher in trading today. Revenue for the quarter ended June 30, 2008, came in at $55.2 million, up 31% from the $42.0 million in the same quarter the prior year. Net income worked out to $11.1 million, up 40% over the $7.9 million last year. Fully diluted earnings per share were $.40, up 38% from the $.29/share last year. As 'icing on the cake' the company announced a 20% increase in the cash dividend to $.30/share from the prior $.25/share payment. QSII beat expectations--analysts had been expecting earnings of $.37/share (they came in at $.40), on revenue of $51.9 million (they came in at $55.2 million). Regarding longer-term results, we can review the Morningstar.com "5-Yr Restated" financials on QSII and see that we had a reason why we have liked this stock in the past! Revenue growth has been steady from $71 million in 2004 to $187 million in 2008. Earnings have grown without interruption from $.40/share in 2004 to $1.40/share in 2008. The company initiated a dividend in 2008 at $1.00/share and now have increased it to a $1.20/share rate. Free cash flow is positive and overall growing from $28 million in 2006 to $41 million in 2008. The balance sheet is solid. As reported by Morningstar.com, the company has $59 million in cash and $91 million in other current assets. This total of $150 million in current assets yields a current ratio over just over 2 when compared to the $70.2 million in current liabilities. Long-term liabilities are quite modest at only $4 million. Looking at a few valuation numbers, we can see on the Yahoo "Key Statistics" page on QSII, that the company is a small cap stock with a market capitalization of only $1.04 billion. The trailing p/e is a modest 26.20 with a forward p/e (fye 31-Mar-10) of 18.90. With the rapid growth in earnings expected, valuation works out to be quite reasonable in terms of the PEG Ratio of .99 (5 yr expected). Yahoo reports 27.45 million shares outstanding with 17.70 million that float. As of 7/10/08, there were 5.77 million shares out short. Compared to the average trading volume of only 246,872 shares (3 month average), this works out to a short ratio of 31 days! I personally utilize a '3 day rule' for significance, so this 31 day figure is quite convincing! With the great results out today, and the stock climbing sharply, this could well represent a short-squeeze for investors. In addition to the great financial results, the company now pays over a 3% dividend, and last split its stock 2:1 March 27, 2006. 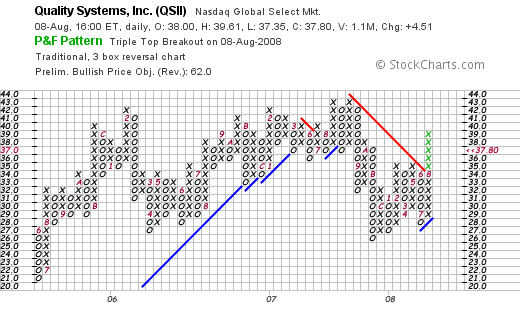 Looking at the "point & figure" chart on Quality Systems (QSII), we can see that the stock has been trading 'sideways' since February, 2006, when the stock peaked at $42. The stock has hit that level several times only to pull back to lower levels. The stock with the current move has broken through resistance once again. It would be nice seeing this stock trade above $44 to confirm this rally has staying power. To summarize, I chose to step out of my Lufkin (LUFK) even though I still respect the underlying fundamentals in that stock. I am concerned about the pressures of a continuing decline in the price of oil. If oil turns around tomorrow, I shall be demonstrating a public lack of any sense of timing. In any case, I hate to have any of my holdings to be as tied to a commodity price as I suspect, or fear that this stock has been. Quality Systems (QSII) beat expectations yesterday and came in with strong revenue growth, earnings growth, and also raised their dividend. The sharp price appreciation was probably driven in part by the oversized short interest outstanding on this stock. Meanwhile, QSII demonstrates real quality with steady revenue growth, earnings growth, stable outstanding shares, an increasing dividend, growing free cash flow, and a solid balance sheet. So this stock isn't a fluke either. Thanks again for visiting! If you have any comments or questions, please feel free to leave them on this website or email me at bobsadviceforstocks@lycos.com. If you get a chance, be sure and visit my Covestor Page where you can monitor my trading portfolio performance, my SocialPicks page where my stock picks are also followed, and my Podcast Page where you can listen to an mp3 or two about some of the stocks written up on this blog. Have a wonderful weekend everyone and wish me luck! Meridian Bioscience (VIVO), ResMed (RMD) "Trading Transparency"
I am absolutely in love with Meridian Bioscience (VIVO) but with the latest quarter mildly disappointing, and the stock lagging while the rest of the market moves higher, I grew impatient today. and started looking for another vehicle for my investment purposes. With all of that in mind, and thinking maybe I could 'fine-tune' my portfolio a little, I sold my 171 shares of Meridian (VIVO) shares today at $25.4844 and went to the list of top % gainers today to find out if there was a better place to park the proceeds. Reviewing the 'top % gainers', I noted that ResMed (RMD) was on the list! This stock has been an 'old favorite' of mine and I have owned it in the past as well. After a review of the news which consisted of a strong earnings report, I thought it might be wise to switch from one medical technology firm to another that was acting a bit healthier. I went ahead and purchased 140 shares of ResMed (RMD) at $43.269. ResMed (RMD) actually closed at $43.09, up $4.84 or 12.65% on the day. Let me review with you some of the facts that led to my decision to buy shares in this company which, as I have written, is an 'old favorite' of mine. First of all, that earnings report. 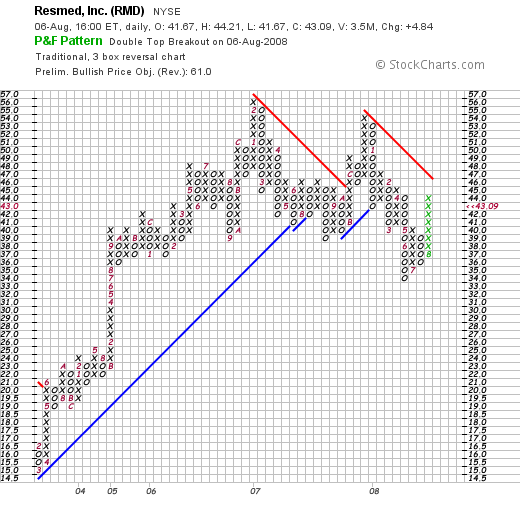 Yesterday, after the close of trading, ResMed (RMD) reported 4th quarter 2008 results. Revenue for the quarter increased 23% to $235.2 million from the prior year same period. Net income was $29.6 million, up from $27.7 million last year. Diluted earnings per share came in at $.38/share, up from $.35/share last year. Excluding some one-time expenses, this would have been $.40/share. Sometimes just as important as the actual result and comparisons to prior quarters, is the question of expectations. In other words, the result was impressive because the 'street' had been expecting earnings of $.39/share. And ResMed beat expectations with its $.40/share result. In addition, with its revenue of $235.2 million, it beat expectations of revenue of $220.3 million according to analysts polled by Thomson Financial. Sleep apnea is big business. "ResMed and bigger rival Respironics Inc control about 80 percent of the $2 billion U.S. market for sleep breathing devices, a rapidly growing market as people become more aware of the links between sleep disorders and heart disease and diabetes." In America alone, it is estimated that 18 million American may suffer from obstructive sleep apnea. And of these, 10 million are undiagnosed. "The condition affects about 4 percent of middle-aged men and 2 percent of middle-aged women. Men in general suffer from sleep apnea more often than women. Children can also have sleep apnea. Sleep apnea in children has been linked to attention deficit/hyperactivity disorder, or ADHD. Some studies suggest sleep apnea runs in families. Studies have linked sleep apnea to high blood pressure, heart attack, and stroke. Up to 50 percent of people with sleep apnea also suffer from high blood pressure. People with sleep apnea are three times more likely to be involved in motor vehicle accidents. People with sleep apnea sometimes fall asleep unexpectedly during the day, such as while talking on the phone or driving. Risk factors for sleep apnea include being overweight and having a large neck. Losing even 10 percent of body weight can help reduce the number of times a person with sleep apnea stops breathing during sleep. African-Americans, Pacific Islanders, and Mexican-Americans may be at increased risk for sleep apnea. Smoking and alcohol use increase the risk of sleep apnea. Continuous positive airway pressure, or CPAP, is the most common, noninvasive treatment for moderate to severe sleep apnea." I share these fact with you both as an investor as well as a patient who also hooks himself up to his own CPAP machine for the last several years! If you or someone you know snores at night, has a large neck size, is a bit overweight....now we are talking about most of us lol....and if your significant other notes that you sometimes stop breathing when you are snoring....well get yourself down to a sleep lab...it could mean the difference between life and death! But looking at the fundamentals, besides that little health plug, we can check with Morningstar.com "5-Yr Restated" results. Here we can see the steady pattern of revenue growth, the slight dip in earnings last year and the subsequent rebound, the modest increase in outstanding shares, the recently improved record of free cash flow, and the very strong balance sheet. You can see how after June, 2007, the stock broke through support levels at the $40 level. Even with today's strong rise, the stock hardly looks over-extended. In fact, it has some upward price appreciation to do before it even confirms this bullish move. I hope I haven't moved in prematurely, but I believe that the financial results are once again on track and that usually, the stock price follows along. At least that is my strategy. Sometimes you got to just jump from one wave and pick up another. Of course, I don't surf. But in my mind, that's what investing in this fashion is all about. I will keep you posted. Meanwhile, wish me luck with this new purchase. If you have any comments or questions, please feel free to leave them on the blog or email me at bobsadviceforstocks@lycos.com. If you get a chance, be sure and visit my Covestor Page where my actual trading portfolio is monitored and evaluated, my SocialPicks Page where my stock picks from the last almost two years are reviewed, and my Podcast Page where you can download an mp3 or two of me discussing some of the many stocks I write about here on this website. I hope the rest of the week goes well and finds you in good health, sleeping well at night without any 'apnea', and finds your portfolio rebounding from the recent correction with profits exceeding losses! I really hated to do this. After owning this stock for one whole day (if you don't count the weekend) I am bailing. I hit my 8% loss limit and sold my shares. I know what all of my 'Seeking Alpha' critics will say. Trading publicly and writing about every one of your trades, including your mistakes, is just something I do around here. It must be one of my masochistic tendencies :). But rules are rules, and after a purchase of a position, I sell the shares if they decline 8%. No matter what. A few moments ago I sold my 280 shares of comScore (SCOR) at $19.52. These shares were purchased this past Friday on August 1, 2008, at a cost of $21.505. Thus, I had a loss of $(1.985) or (9.2)% on this position. I still like the stock and am selling the stock not because of some fundamental reason that I know about, but rather because the sheer negative price pressure resulted in a loss that triggered my sale. Thus, I am reducing my rating a notch. Unfortunately, I can already hear the hoots and howls over at SA. They are well deserved. How can I reduce my rating so quickly? I can only answer, would it be fair to leave my rating as "BUY" when I go and SELL? Furthermore, would it be fair to lower my rating to "SELL" just because I have sold my own shares? Especially when I use my own idiosyncratic approach to buying and selling my shares? I don't have a good answer for these questions. I do know that trading in the public's eyes isn't easy. But I shall be sticking to all of my rules as I try to make heads or tails of investing on my Blog and in my actual trading account. Wish me luck. I needed some of that today. As I wrote up previously, my shares of Graham (GHM) hit a sale point on the upside (even while the market continued to correct! ), and being under my maximum of 20 positions, this trade generated a 'permission slip' entitling me to add a new position. And add a position is what I did! Like this Richard Seaman photo of surfers, I try to jump off one wave and catch the next! O.K., I have NEVER, EVER been surfing, but I have watched surfers :). So looking for the next 'wave, I headed to my 'wave chart', that is the stocks making the top percentage gainers list. Checking the list of top % gainers from the NASDAQ on Friday, I came across comScore (SCOR), a stock that I have not previously reviewed, and liked what I saw. I purchased 280 shares of comScore (SCOR) at $21.505. SCOR traded a bit erratically through the day and closed at $20.60, up $1.52 or 7.97% on the day. I am a bit 'underwater' on this stock, with an unrealized loss of $(.905) or (4.2)% since my purchase earlier the same day! "...provides a digital marketing intelligence platform that helps customers make informed business decisions and implement digital business strategies in the United States, the United Kingdom, France, Germany, and Canada. Its products and solutions offer insights into consumer behavior, including objective, detailed information regarding usage of their online properties and those of their competitors, coupled with information on consumer demographic characteristics, attitudes, lifestyles, and offline behavior." How about their latest quarter? It was the release of 2nd quarter 2008 results after the close of trading that drove the stock higher Friday. Total revenue for the quarter climbed 38% to $28.8 million, from $20.8 million in the prior year same period. Net income climbed 38% to $1.7 million from $1.24 million the prior year. Earnings per share came in at $.06/share compared to $-0- the prior year. Excluding a recent acquisition of M:Metrics, this was $.09/share. The company beat analysts' expectations of $.07/share on $27.69 million in revenue according to Thomson Reuters. Topping off the rest of the good news, the company also raised guidance for the upcoming 3rd quarter. "For the third quarter, comScore expects a profit of 1 to 2 cents per share, or 13 cents to 14 cents per share when excluding items, on revenue of $30.2 million to $30.7 million. Analysts, whose estimates typically exclude special items, expect a profit of 8 cents per share on $29.5 million in revenue." However not all of the news was good as the company, while raising 2008 revenue expectations to $119.7 to $120.4 million (ahead of analysts who were expecting $116 million), did lower earnings to $.22 to $.23/share (or $.71 to $.73/share on an adjusted basis, while analysts had been expecting $.36/share. "In a note to investors, Jefferies & Co. analyst Youssef H. Squali reiterated his "Buy" rating for comScore and raised his price target by $1 to $28, saying that demand for the company's products is strong despite a difficult economic environment. "While not cheap, comSore is a compelling value considering its sound fundamentals, leadership position in a growing segment of the Internet and relative resiliency to a weakening economy," he said." Examining the Morningstar.com "5-Yr Restated" financials on SCOR, we can see the steady picture of revenue growth from $23 million in 2003 to $87 million in 2007 and $95 million in the trailing twelve months (TTM). This company is just turning profitable with losses diminishing from $(6.96)/share in 2003 to break-even in 2006, $.88/share in 2007 and $.96/share in the TTM. No dividends are paid and the company aggressively expanded its shares outstanding in 2007 to 18 million from 4 million in 2006. Free cash flow is positive and growing with $3 million in 2005, $9 million in 2006, $18 million in 2007 and $22 million in the TTM. The balance sheet is solid with $54.0 million in cash and $76 million in other current assets, which when compared to the $45.5 milllion in in current liabilities yields a current ratio of 2.86. Checking Yahoo "Key Statistics", we can see that this is a small cap stock with a market capitalization of only $589.63 million. The trailing p/e is a bit rich at 28.07, with a forward p/e (fye 31-Dec-09) estimated at 39.62. The PEG (5 yr expected) is also richly priced at 2.29. Utilizing the Fidelity.com eresearch website for some additional valuation numbers, we can see that the Price/Sales (TTM) is reasonable relative to its peers, with SCOR coming in at 6.03 relative to an industry average of 7.53. When measured by the Return on Equity (TTM), the company also does well relative to its peers coming in at 41.24% vs. the industry average of 28.31%. Returning to Yahoo, we can see that there are 28.62 million shares outstanding but only 8.31 million that float. As of 7/10/08, there were 2.28 million shares out short, representing 5.2 trading days of volume (the short ratio). This is well above my own '3 day rule' for short interest, so we may have actually been seeing a bit of a short squeeze on Friday. No cash dividends are paid and no stock dividends are reported on Yahoo. The chart is actually one of the weakest findings on this particular stock. 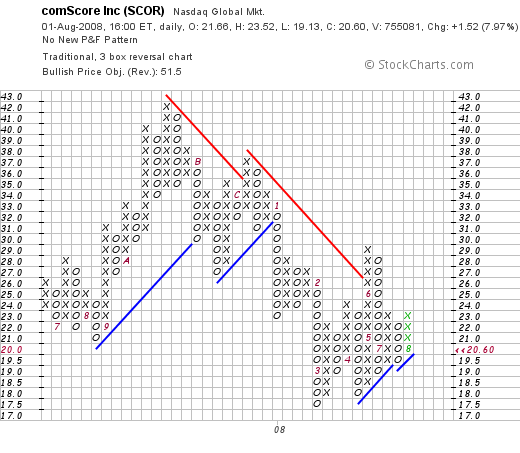 Reviewing the 'point & figure' chart on comScore (SCOR) from StockCharts.com, we can see how the stock price actually peaked in October, 2007, at $42/share, before dipping all of the way down to $17.5 in March, 2008. The stock has recently been attempting to move higher, breaking through resistance and and making higher lows, but the upward move is certainly not confirmed yet. Well, I like this stock enough to buy some shares! Seriously, they are a very small company in a very interesting niche doing research on internet traffic. They certainly also have to deal with Google, the '800-pound gorilla' in the field of internet traffic. Their price has been very volatile and recently has been under pressure. However, the latest quarter was strong, beating expectations and the company also raised guidance. 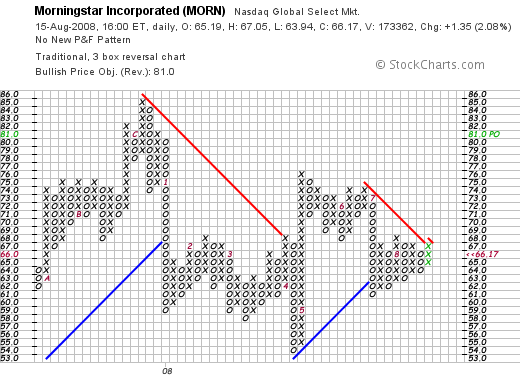 Their Morningstar.com numbers show a certain consistency in improving financial results that I like. Valuation appears a bit rich, but the company is just turning profitable. Finally the chart, while recently a bit more optimistic, is far from being over-extended. Thanks again for visiting my blog! If you have any comments or questions, please feel free to leave them on the website or email me at bobsadviceforstocks@lycos.com. If you get a chance, be sure and visit my Covestor Page where you can monitor my actual trading portfolio performance. In addition, consider dropping by my SocialPicks page where my past stock picks from the last two years are reviewed. Finally, consider visiting my Podcast Website, where you can download some mp3's of me discussing some of the many stocks reviewed on this website. Wishing you all a healthy and financially profitable week ahead! The market had another dismal performance today with the Dow closing at 11,326.32, down (51.70), and the Nasdaq down (14.59) at 2,310.96. The S&P index dipped (7.07) to 1,260.31. Oil rebounded from the recent correction and climbed $1.02 on the day to $125.10/barrel. In spite of this miserable trading environment, my shares in Graham (GHM) enjoyed a nice move higher, closing at $101.97, up $12.97/share or 14.57% on the day. I acquired my original 105 shares of Graham (GHM) 5/30/08 (just two months ago) at a cost basis of $64.48/share. Two weeks ago, I sold 15 shares of Graham (1/7th of my holding) at $85.46, representing a gain of $20.98/share or 32.5% since purchase. The 30% appreciation level is, as you may know, my first 'targeted' appreciation level at which time I sell 1/7th of my holding and use this as a "signal" to be buying a new position. The next appreciation target is at a 60% appreciation level. Today, after announcing 1st quarter 2009 results with sales climbing 38.3% to $27.6 million from $20.0 million in the year-earlier same period, and net income up over 100% to $5.7 million or $1.11/diluted share compared to earnings of $2.7 million or $.53/diluted share the year earlier, the stock literally exploded on the upside. And that in the midst of a nasty market environment. Going along with my system of selling small portions at targeted appreciation levels, my next sale point would be at a 90% appreciation level from my original purchase price which would work out to 1.90 x $64.48 = $122.51. On the downside, having sold a portion of Graham (GHM) twice, both at the 30 and 60% appreciation levels, my sale would be at 1/2 of the highest appreciation percentage or at a 30% gain. (NOT at 1/2 of the highest appreciation PRICE...you can see the difference). This would work out to 1.3 x $64.48 = $83.82. My 'portfolio management system' generates buy and hold signals upon the sale of my own holdings. In other words, when I generate a sale on 'good news' like this Graham transaction, I generate a 'permission slip' to be adding a new position. When I generate sales on declines, I simply am required to 'sit on my hands' unless I am at the minimum, which for me is 5 positions. Since I was at 6 positions, not at the maximum (20), this sale on good news generated a 'buy signal' and that nickel started burning a hole in my pocket immediately. I did find a stock to buy.....but THAT is a discussion for another blog entry entirely! Thanks so much for stopping by and visiting my blog! If you have any comments or questions, please feel free to leave them right on the website or email me at bobsadviceforstocks@lycos.com. If you can, be sure and visit my Covestor Page where my actual trading portfolio is monitored and evaluated. Also, consider checking out my SocialPicks page where my stock picks from the last two years are reviewed. Finally, if you are interested, you might wish to visit my Podcast page where you can download some mp3's of me discussing some of the many topics and stocks reviewed on this website. Meridian Bioscience (VIVO) "Trading Transparency---Closing Out My Trade"
If you have been following my ongoing 'saga' with Meridian (VIVO), you will know that last week, after the 17% decline in the stock price from about $29 to $24, I chose to put on my 'contrarian hat' and bought 2000 shares of Meridian (on margin!). The stock didn't decline further, actually had an upgrade to "long-term buy" and managed to rebound to its current level. (VIVO is trading at $26.00, down $(.37) or (1.4)% on the day as I write (last quote as of 12:27 pm EST). This kind of "trading" is not my forte. I work my portfolio as more of a system trader until every once in awhile I get the 'bug', and take a shot at what I believe is an opportunity I should not ignore. I have been wrong as often as I have been right. As one reader told me "stick to your system"....and I generally do. Anyhow, I wanted to update you on the last 500 of the 2000 shares that I sold just a few moments ago (leaving me with my 171 shares of Meridian (VIVO) that I shall continue to manage in my usual fashion). This morning I sold my last 500 shares in two lots: 250 at $26.531, and 250 at $26.1854. Unfortunately, my Fidelity account does what is called "first in first out" accounting, It really isn't bad like I say because long-term gains are taxed at a lower rate than short-term gains. So I saved a bunch of money....at least a little :). However, I have been using those % numbers on the website to figure my own sale points. So go figure. Meridian Bioscience (VIVO): 171 shares, purchased 4/21/05 at a cost basis of $7.42. VIVO closed at $27.74 for a gain of $20.32 or 273.9% since purchase. I have sold portions of VIVO eight times (!) at levels of 30, 60, 90, 120, 180, 240, 300, and 360% appreciation targets. Thus on the downside, if VIVO slips further to the 180% appreciation level or $7.42 x 2.8 = $20.78, then I would sell all of my shares. On the upside, a partial sale would next be at a 450% appreciatio level or 5.5 x $7.42 = $40.81. Boy am I glad I had written that one up! So thanks again for dropping by and visiting. Trades like the above are quite dangerous and prone to loss. Especially buying shares of a declining stock. But getting lucky is probably helpful. Perhaps I should have held on longer. I am not interested in getting away from my own investment strategy that has been working. I just would like to try to dabble in 'trading' and see if I can master any of those skills. And I know, I should 'stick to my system' and shall try very hard to do that as well! Meridian Bioscience (VIVO) "Trading Transparency"
I wanted to update you about my holding in Meridian (VIVO), and my 'trade' that I made going against the tide, buying shares in a company that I truly admire, and a company that has been my best performer long-term. Sitting with a bunch of margin didn't really make me feel great in contrast to my trading strategy of methodically buying and selling portions of my relatively small positions. It just isn't me! So with Meridian bouncing higher today, I sold 1000 shares of my 1500 remaining 'trade' position (out of the original 2000 shares). 500 shares were sold at $25.20, and 500 shares were sold at $26.03. Recall that these shares were JUST purchased at approximately $23.98 (I had several lots purchased to make the 2,000 share position), on 7/17/08, just last Thursday! I still have 500 shares of this trade remaining. I shall try to be a bit more patient with the stock which as I write is trading at $25.00, up $1.04 or 4.34% on the day. It still represents a big 'chunk of change' for me but it is a level I can tolerate for now. Trading stocks, as opposed to investing, involves an entirely different set of disciplines, and I do not believe I have those skills....although I continue to work at them....and you have to admit, this last trade has worked out nicely thus far! Anyhow, I wanted to keep you all posted. I am planning to get back to my original 171 share position and then manage it as I have been all along, with the cautious and timely transactions that define my 'strategy'.